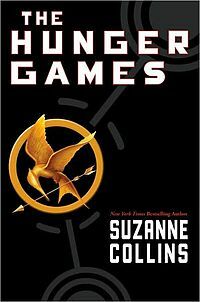 Hunger Games by Susane Collins is a very good book. It is about a 16 year old girl named Katniss Everdeen, who was chosen (or was she?) to go into the annual Hunger Games. The back story of Panem (where Katniss lives) is that the people of north America got into a huge war, and one group won. They turned North America into a shining Capitol with 12 towns circling it (13 "districts" in all). The Capitol is called District 1 and the inner most ring is District 2, and they go in numerical order 1-13. The lower number district you are, the poorer you are. When the districts tried to rebel against the Capitol, they destroyed the 13th district and started hosting these games called the Hunger Games. In the Hunger Games one boy and one girl from each district must go into the "arena" and fight each other to the death. When the 74 Hunger Games starts, you can be sure that her life was never the same again. My favorite character is Gale. He's Katniss' friend from district 12. I think I mostly like him because all my friends will at some point in time come up to me and ask me "Gale or Peeta?" (comparison: "Edward or Jacob?" I personally think Peeta is a jerk. I think that I don't like him because of all the kissy-uppy things he does during the book. Like, confessing his love to Katniss at the most inappropriate times. Also a thing to note is that my mom didn't want me to read this book. So if you think a parent would have a problem with it, CHECK WITH THEM FIRST. This book is very violent and some stuff happens in the 2nd and 3rd books that caused my mom to say no. Glad you enjoyed it!! It IS very violent, and I agree it's best to get your parents' OK. My son just started it - he's 14. Did you know there's a movie coming out soon? We can't wait!! Yes, I did know that their is going to be a movie. I'm soooooooooooooooooo excited for it! Did you get to read CATCHING FIRE and MOCKINGJAY yet, or is mom having you wait? I haven't read Catching Fire or Mockingjay, but my mom says I can read them after my birthday which is March 19th. accually, the capitol is different from district 1, but whatever, i can forgive that beacause you're awesome. don't get too exited, remembeer how the percy jacksin movie turned out?? p.s. i don't know if i'm Peeta or Gale, but, (spoiler alert!) Peeta and her sorta get married so..... yeah, but they r both awesome and romantic and stuff. -MAYA!!!!!!!!!!!!!!!!!! !